Moukey MMS-2 adjustable music stand uses better materials and processes to ensure stent atability. Whether you are a student or a musician, you will need a music stand when playing music. That time, our product will give you the best support. Just enjoy you music. Bearing capacity of the music stand is up to 20 pounds. It can be used to display books, laptops, tablets and so on. The height adjustment tube adopts 1.18" &1.0" thickened iron pipe. And the joint is made of nylon material to ensure stability of the overall bracket. You can simply fold it flat and place it in the carry bag in minutes. Friction locking clutch allows you to adjust the height of the music stand based on your Instrument height. The tilting of the bookplate can be easily adjusted to an angle that is comfortable for you. And the height can be changed within the range of 32-56.5 inches via 3 different points of this stand for music sheets. To make this folding music stand more user-friendly, it also comes with a waterproof carry bag. Once you place the stand in the carry bag, you can easily transport it in your own vehicle, carry it to your destination by foot or take public transport without a hassle. Come with extra accessories: music stand light, USB cable(power for music stand light), black carrying bag and music sheet clip holder. 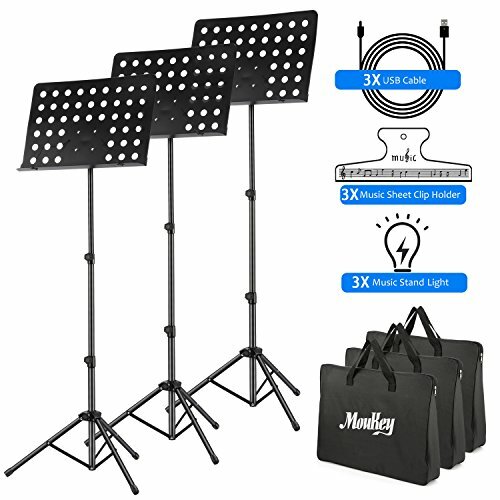 Moukey MMS-2 adjustable music stand, spend the least money to enjoy the best experience, you deserve it! 1.High Quality: Use thick steel as raw material, through the surface coating process, make the music stand smooth and strong stability. Very stable to support the music book, laptop,etc. 2.Adjustable and Flexible: The height can be adjusted from 23 inches to 62 inches to meet the needs of different people sitting or standing, 13.2" x 19.6" metal bookplate tilts and is fully adjustable, 1.75" platform holds large music and heavy song books ,with metal spring arm extensions hold the music sheets securely in place ,suit for school, orchestras, choirs, church bands, classrooms. 3.Easy To Store: Unscrew the knob to adjust the height and tighten the knob to fix the height. Slides the metal tab into plate on the back of the book plate and keep the knob on top when install. 4.Shaft and legs are made of high strength tubular steel, thicker walls, high quality thicker tube diameters and thicker soft rubber feet improve stability. 5. Extra Accessories: Come with music stand light, USB cable(power for music stand light), black carrying bag and music sheet clip holder. If you have any questions about this product by Moukey, contact us by completing and submitting the form below. If you are looking for a specif part number, please include it with your message.